Pst JJ wrote: Would love to do that trip one day, definitely on my bucket list! If I had my family with me it would have been a different story but being alone a few days stuck on the side of the road would not have been an issue. I could have been self sufficient for a week. I am a bush mechanic and carry a suite of spares and tools. My boss flies and knows the area like the back of his hand as he flew explosives into a mine in the Hartman Valley for years. If I was not back within 2 days of advertised I know there would be eyes in the sky. My route was known to a bunch of people and the Marienfluss is a busy highway compared to the Hartman valley. I actually had time to do the Hartman valley but being in the Hartman with no-one knowing would have wiped out all my back-up plans I sat for half an hour at the junction agonising over whether to go off route, but sense prevailed. So I stuck to the Marienfluss. Next trip is to the Hartman Valley. Any takers? I am also an exploration geologist meaning that I have done solo trips in Ghana, DRC and Peru. Just watched Andrew St. Pierre White do Van Zyl's in a Croozer. Your report is much more enjoyable. El Niño, aka Pa-se-Kar, my long-suffering GQ will, God-willing, be trudging the Pass before too long. I have often wandered about the true difficulty of Van Zyl's. I know somebody who has towed a big off-road caravan down there with a standard Pajero. The IRS model. And having driven a few trails in the company of those, i don't have a particularly high opinion of their off-road ability, especially in rocks. Therefore i must assume that, in order cor Steve to rate it a 4, it must show substantial seasonal changes? The up sections are relatively easy. There is one hairy down section that if you were towing and took a bad line you could end up in serious problems. Something that also makes it seem worse are the sides of the road are steep. If you blinkered yourself it would not be bad at all. I did not use diff-loc. I maybe skidded a wheel twice for <0.5m. I did not have to build up the road. I got out once to check ahead. I once scraped a pumpkin. So mid-to upper 3 to 4. Images like that put the fear of god into people. But that section was a steep bit of axle twister. That fact that all the bad sections are downhill means that s slow steady pace and you are through. Lots of tyre torture. The east to west is a prudent but with locker front and rear and again a steady approach you could do it would without trail damage. It wouldn't take long for a few monkeys with lead feet to screw it up though. Peter Connan wrote: I have often wandered about the true difficulty of Van Zyl's. Peter, I would rate it a solid 3 (rather than 4). The reason why it has a bad reputation is mostly because everyone drives it that tours in that area. You can't rally avoid it if you want to travel from the Western to Eastern part of Northern Namibia. Everyone, includes all overlanders of all levels of experience, rather than weekend trail drivers only. If you are not used to driving trails like Moegatle, At se Gat, Rust de Winter, etc. then doing a 3 rated trail will result in war-stories afterwards. When I was there in July 2016, there were two families with trailers driving past us (we waited for them to pass as they were in a hurry). So it is clearly no big deal to experienced drivers. But I still don't believe it is a trail that should be driven with trailers, unless you rate yourself to drive a grade 3 trail with your trailer. 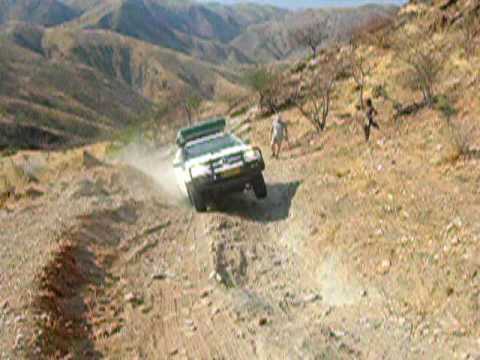 Alex Roux wrote: Everyone, includes all overlanders of all levels of experience, rather than weekend trail drivers only. This is kind-of what I have been surmising. Relatively few people do both overlanding and trail-driving. I guess part of this is that few vehicles do both well, which may explain why we have a preponderance of guys who do both. The pass also changes with time. The owners of Camp Syncro remarked that the pass was alot worse 10 years ago... so old timers telling war stories would have a different experience to now. In the last 3 years there have a been a few roll overs. The only serious one was an Australian that rolled his car several times attempting to go west to east.